There are only a handful of football players who you could count on for a successful performance at the end of every game. The likes of Aqib Talib are pretty confident and versatile when it comes to game plays. He is one player who is willing to give his best for any game. Talib is very intense and feisty on the field. He has great athletic speed with a knack for the interception. With his body size and leaping ability which is above average, Talib is best at getting balls at the highest point. In the course of his professional career, he has earned for himself a good number of awards some of which include the Super Bowl championship and the Unanimous All-American. Let’s learn some more fact about the great American football cornerback. Who is Aqib Talib of NFL? Aqib Talib is a professional American football cornerback who plays for the Los Angeles Rams. He is a native of Cleveland Ohio, born on February 13, 1986, into a family of six which consists of his father, Theodore, his mother, Donna Henry and his three older siblings: Saran, Kai, and Yaqub. Donna who converted to Islam chose to name her son Aqib meaning “the last one” in Arabic. His surname Talib was also drawn from the Arabic, meaning “student”. Aqib and his siblings grew up with his mother in Texas where they moved to after his parents separated. Talib started playing football in high school. He attended Berkner High School which is based in Richardson, Texas and with the Rams athletic teams, he was actively involved in football, basketball, and track sports. Following excellent football skills displayed by young Talib both in his junior and senior seasons, he earned the first-team all-district, first-team all-city honors and was crowned with the Berkner High School’s Defensive Back of the Year. Moving on to college, Talib received a scholarship from different schools including the Baylor University, Wyoming, Kansas and Kansas State but he chose to attend the University of Kansas where he joined the Kansas Jayhawks football team and played with them from 2005 to 2007. 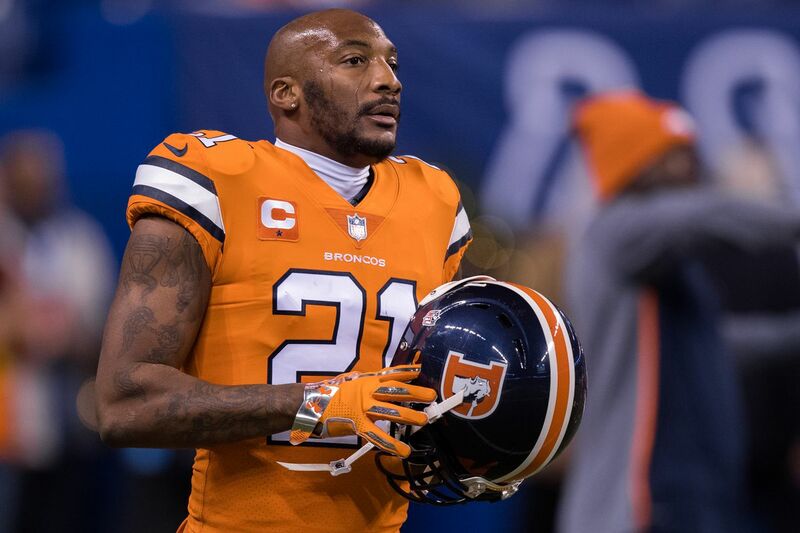 While studying, young Aqib Talib continued to distinguish himself through his strong defensive skills and was later counted as one of the best and successful college football defensive in the country. Talib ended his college career in 2007, forgoing his senior season. He finished with a total of 162 tackles, 13 interceptions, 43 passes defended, 2 fumbles recoveries and 2 forced fumbles in 34 games. This earned him a better and higher public recognition like the Orange Bowl 2008 Most Valuable Player. Aquib became a professional football player in 2008 after he was invited to join the 2008 NFL Combine. He was then selected by the Tampa Bay Buccaneers in the first round and 20th overall of the NFL 2008 Draft and on July 25, 2008, he signed his first contract as a professional. Talib finished his rookie season appearing in 15 games and making 23 combined tackles, 4 interceptions, and nine pass deflections. Aqib Talib continued his games with the Buccaneers for five active seasons before he was traded to the New England Patriots in November 2012. While with the Buccaneers, Talib racked up a total of 182 tackles (163 solos), 18 interceptions and 54 pass deflections. His move to his new team followed his suspension by the NFL, for testing positive to performance-enhancing substance. Returning on November 12, 2012, after his suspension for four games, Talib debuted with his new team in a game against the Indianapolis Colts and he made 40 tackles (33 solo), 2 interceptions, one fumble recovery and 10 passes defended. He left the Patriots in 2014 and became a free agent. He then signed a six-year deal worth $57 million with the Denver Broncos and played for the football franchise from 2014 to 2017. In March 2018, he was traded to the Los Angeles Rams and he debuted at the beginning of the season as a starting cornerback. Despite suffering an ankle injury in the season’s week 3, Talib was still able to make good records for the season. His career stats from 2008 to 2018 shows he has a total of 448 total tackles with 70 assisted tackles,752 interceptions, and 35 forced interceptions. Following a couple of mouth-watering contracts the young athlete has signed, it won’t be wrong to list him among the wealthy players of the NFL. Talib’s first contract was worth $14 million with $8 million guaranteed but after about ten years of football experience as a professional, his deal has greatly increased. As of March 2018, he signed a $57 million contract, including a $5 million contract bonus and $25 million guaranteed, with the Los Angeles Rams. The young athlete’s salary as of 2018 is $11 million but his net worth is not yet known. As the youngest child in the family of six, Talib has been able to build a family of his own. The American football cornerback for the Los Angeles Rams married his longtime girlfriend, Gypsy Benitez on March 26, 2016, and together they have two children one of which is Jabril the youngest. He also has a daughter Kiara, whom he had from his previous relationship with his college girlfriend Courtney Jacobs. Aqib Talib is quite tall with a height of 6 feet 1 inch and a body weight of 93 kg. He was 6 feet 3/4 inches tall with a body weight of 92 kg in 2008 when he joined the NFL draft. The length of his arm was 33 inches and the size of his hand was 9 3⁄8 in.